Chocolate Orange Peels for sale. Buy online at Zingerman's Mail Order. Gourmet Gifts. Food Gifts. Show-stopping Calabrian citrus, robed in chocolate. Calabria, in Southern Italy, is to citrus like Maine is to blueberries. The fruit they have is found elsewhere, but it's rarely better. For fifty years the folks at Dolci Pensieri di Calabria have been preserving great citrus. We found them a decade ago, long after they had mastered the technique. They start with fresh, aromatic Calabrian oranges. The peels and pith are removed by hand, the peels cut into strips. They're candied in a sugar bath and put in an oven at low heat for hours to caramelize slightly. Finally, they're hand dipped into a bath of rich chocolate and laid out to cool. The result is one of those sweet treats that looks simple but has a complex, lingering flavor that haunts you for hours. 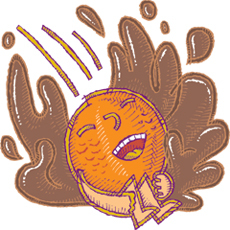 The slight bitterness of the orange peel is tamed by the smooth coat of chocolate, leaving a clean, fruity finish in your mouth as the chocolate melts. If you're like me and avoid most citrus-flavored chocolates because of their chemical aftertaste these will change your whole outlook.